Creating a healthy attitude to work through creative expression. Deborah Halpern's Portal to Another Time and Place in the grounds of Werribee Mansion. Artists perform the extraordinary work of shaping the way the rest of us see the world, but I believe it is important that in our own work and lives we don’t neglect our own inner creatives. I love the fact that my work puts me in touch with entrepreneurs, creators, and adventure seekers from a range of industries, all with their own unique perspectives on the world. One of my cool clients is a world-renowned sculpture artist, Deborah Halpern, whose works are made to sit within, and reflect a particular space, but being in the public space as they are, they will naturally come to influence that space, and the people who pass through it. A great example of this is probably her best known, and internationally recognised, work – the iconic Angel. Commissioned for the moat of the National Gallery of Victoria (NGV) the sculpture was intended to capture the vibrant and quirky character of Melbourne, but soon became an iconic part of our city in its own right. The National Gallery of Victoria (NGV) commissioned Deborah Halpern’s famous sculpture Angel, which stood in front of the NGV for 17 years. Angel was created to Melbourne’s “wild, whimsical and colourful” identity and now lives in Birrarung Marr in Melbourne’s CBD. Over the past thirty years, Angel has continued as a commanding presence in Melbourne’s CBD. This everyday art fascinates me. As an entrepreneur in the business of coaching other entrepreneurs, I value the role of everyday creativity, and I believe in the importance of the exchange of ideas, of including creative elements in our offices and work routines, and appreciating creativity such as Halpern’s sculptures that enliven our often grey business districts. The sense of adventure and playfulness that this everyday creativity and these creative spaces encourage is something that can only enhance our ‘serious’ work. “The aim was to create an artwork of interest to younger people and those who were not so interested in the art world, to entice them into the gallery to discover more,” Halpern explains. Halpern is one entrepreneurial spirit who knew the significant link between art and work long before she was given the chance to contribute to her city’s landscape with the game-changing sculpture Angel. “Growing up in beautiful Warrandyte, being part of this interesting, creative, entrepreneurial group of people and their children and their friends, was pivotal in showing me what it’s like to live a creative, self-directed life,” Halpern says of her early experiences. Deborah’s parents – Artek and Sylvia – built a house in Warrandyte in the 1960’s and founded a humble enterprise which they called Potters Cottage. Warrandyte, 24km north-east of Melbourne’s CBD, was peopled by painters, potters, sculptors, writers, stonemasons, gardeners, intellectuals, architects and film-makers. Growing up in this intellectually fertile setting could not help but shape Halpern and she tells me she was greatly influenced by seeing artists “making a living from their art.” As Halpern, in turn, sought to do the same, her entrepreneurial muscles developed. From here Halpern could have knuckled down to do what many business-people believe they have to do – research exactly what the market wants and provide it. But she chose a different path. For her first exhibition at Potters Cottage, Halpern gave herself the challenge of making work unlike anything she had ever seen before. “It was a huge risk. I thought it could go really badly!” She combined rubber gorillas in ballet tutus with superman dolls, and ceramic buildings with poetry stamped on the sides. Small worlds each with their own story. The work was not carefully crafted to please. It was bold and experimental, yet the show was a great success. In 1985, Deborah applied for and was awarded a travel grant from the Australia Council. She travelled to Europe where she studied Outsider Artists and art. Deborah spent nine months in Italy, Holland, France and Spain. Outsider Art, or Art Brut, became a recognised movement (though not recognised in all art circles) when the French artist Jean Dubuffet started to collect artworks he considered to be free from societal constraints. This included graffiti, the art of children, psychiatric patients, prisoners and primitive artists who create art outside the conventional structures of art training and art production for the raw expression of a vision or an emotion. Outsider Art, like Halpern’s experiments in pottery, was not crafted to please. Or rather, it was created, not to please an audience, but the creator. Inspired by this free-ranging creativity, Halpern applied the concept to her own works. 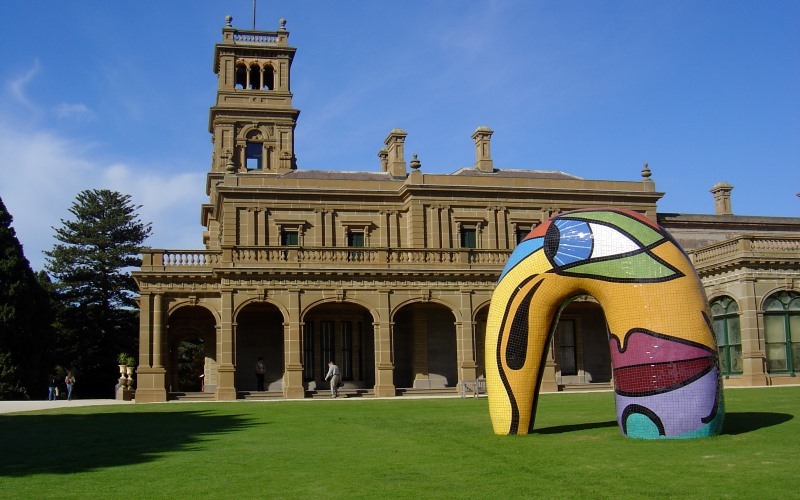 Angel was created as a gateway piece for those not already engaged with the art world, but it was perhaps her later sculpture Ophelia that was to have an even greater impact on the residents, tourists and business people of Melbourne. Southgate’s resident art sculpture Ophelia on the Yarra River river promenade. The sculpture was named as the “Face of Melbourne” and was inspired by the character from Hamlet, full of both love and sadness. That idea of Ophelia living a “full life” really struck me, as I think that all too often we compartmentalise our lives and the lives of others. If you are a business person then your focus is on the serious business of, well, running your business. Only artists and creative types have the freedom to explore and give their imaginations fanciful vent. This is not true at all. Entrepreneurs need to approach the world creatively or they will only replicate stale old practices, and artists are by necessity entrepreneurial in the self-sufficient creation and marketing of their work. This is the true value of the creative spaces that artworks like Halpern’s reflect and create. Seeking everyday adventure and creativity makes our work (whatever our work is) and our lives healthy and meaningful. So let me encourage you to learn from the creative people around you (they won’t all be artists) and to learn from the creative spaces around you. Our cities and places of work can seem dully utilitarian places when that is where we focus our attention (it is all too easy to see only the grey walls until your attention is caught by the bright mosaic angel) but take the time to notice the creative contributions made to these spaces – it is something not just to enjoy, but to learn from. by Katie Beecher, MS, LPC.